Boone Hall Plantation was developed in several stages from the late seventeenth century through mid-twentieth century by the Boone, Horlbeck, and Stone families, as well as others. It retains a slave street, smokehouse, oak allee, and pecan groves that date from the occupancy of the Boones and Horlbecks; an antebellum cotton ginhouse also dating from that period, modified by the Stones; and a brick manor house (ca. 1936) with formal garden, two ca. 1935 frame residences, an office/commissary, and a barn complex from the Stones’ occupancy. The house is a two-and-one half story masonry building with a brick exterior in the Colonial Revival style. The ensemble of intact antebellum properties, later nineteenth century elements, twentieth century residences and service buildings effectively conveys the post-Reconstruction era of land use in the Lowcountry. Thomas Stone’s house and related structures and landscape are significant for their association with the trend of wealthy northerners acquiring former plantations in the South and converting them for new agricultural enterprises or second homes for winter recreation. The Slave Street, Smokehouse and Allee are those elements of the plantation that effectively convey aspects of the history of the property from the mid-eighteenth to the mid-nineteenth century. 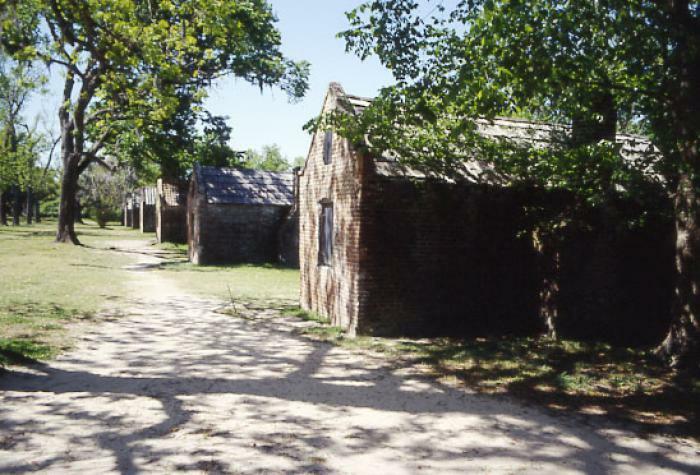 The slave street, one of the few surviving such streets in South Carolina, is a good example of the nature of slave housing in the antebellum plantations of the state. The allee is a significant work of antebellum landscape architecture. Additionally, some of the brick slave houses and the brick smokehouse on the property embody the distinctive characteristics of eighteenth and early nineteenth century brick masonry in South Carolina. Listed in the National Register July 14, 1983; Boundary increase January 21, 1994.